Let's face it, even if my goal is to cook every meal from scratch, life happens. That is why I am always preaching to y'all about keeping a well stock freezer and pantry with quality ingredients. This way when busy days occur you can still put a fun, delicious, and flavorful meal on the table! Take my Spicy Thai Shrimp Tacos using SeaPak® Party-Sized Popcorn Shrimp. 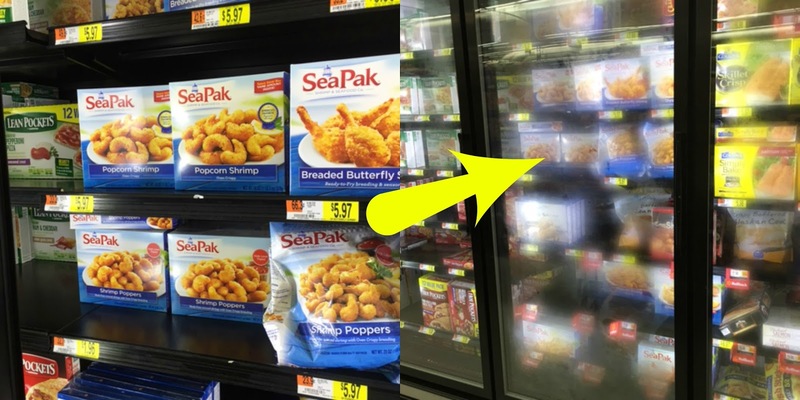 Easily found in the freezer section of your local Walmart, SeaPak® offers high quality, coastal tasting seafood that can be on your table in minutes. Never tried it? Here's a coupon! Check it out, I know you will love it! 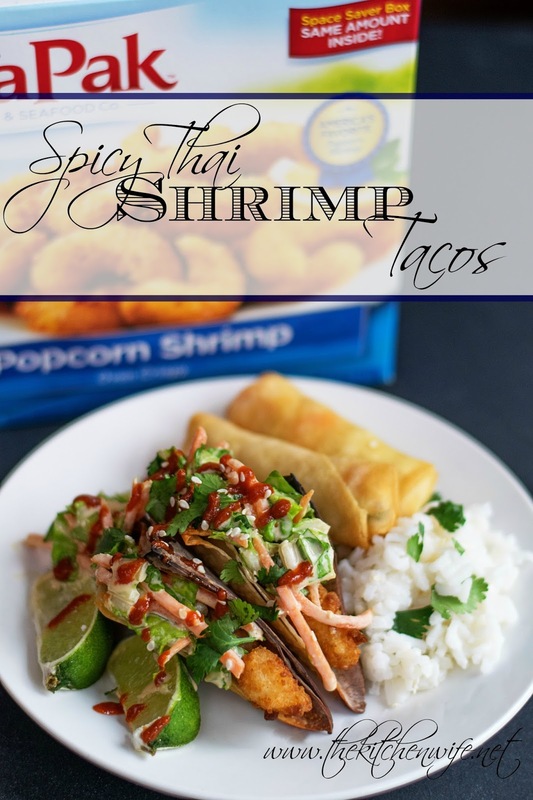 Now let me share with you how I make these Spicy Thai Shrimp Tacos! For these tacos we are going to make an Asian style slaw. To begin you will rinse the Napa cabbage leaves, stack them on top of one another, cut off the stem, and roll them up. Cut into a small dice. Whisk the slaw sauce together until smooth. Toss until everything is evenly coated and place into the refrigerator while you finish all of the other elements. On a greased, foil lined baking dish, place the SeaPak® popcorn shrimp. I also grabbed the SeaPak® Shrimp Egg Rolls. I thought it would be a fun addition to the dish. Cook according to the instructions on the box. Now lets talk about the "taco shells". In staying with the Asian them of this dish, I thought it would be super fun to use wonton wrappers! To get them nice and crispy, take two wrappers (this will be a double layer) and drape over the side of a greased baking dish. Give them a little spritz of cooking spray and bake in the oven for 5-7 minutes until golden brown! As I said before you will want to use TWO WRAPPERS PER TACO. If you don't the shells will be too brittle. Place approximately three shrimp per taco. Then top with cilantro, lime juice, sesame seeds, and sriracha! PERFECTION!!! 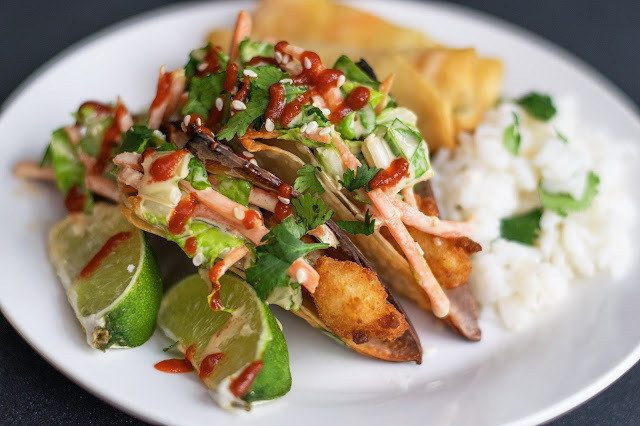 I served these Spicy Thai Shrimp Tacos with my Cilantro Lime Rice and the SeaPak® Shrimp Egg Rolls. It was a HUGE hit! 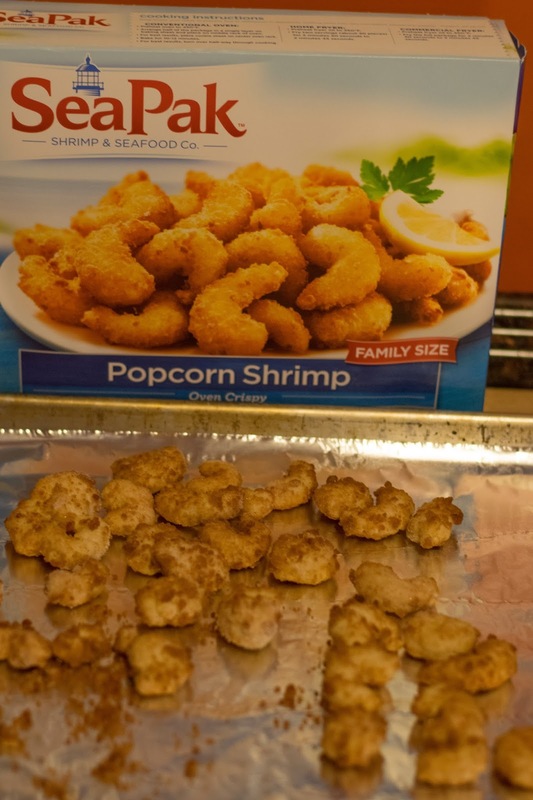 So see, when you keep quality ingredients in your freezer such as SeaPak® Popcorn Shrimp, you can have a fantastic Dinner, full of fun, fresh ingredients, on the table in UNDER 30 minutes! If you love this recipe I would like to hear your feedbacks in the comments as well as ideas you have for using SeaPak® brands at Walmart to #ShrimpItUp! Now cut the stacked and rolled cabbage into ribbons, and then cut into a small dice. In a mixing bowl whisk together the mayonnaise, rice wine vinegar, soy sauce, teriyaki sauce, hoisin sauce, toasted sesame oil, and the grated ginger. Add the carrots and chopped cabbage and toss until everything is coated in the slaw sauce. Place in the refrigerator to chill. Bake the SeaPak Popcorn Shrimp according to the directions on the box. For the taco shells take two wonton wrappers (as a double layer), and drape over a greased baking dish, spritz with cooking spray, and bake in a 450 degree oven for 5-7 minutes. Assemble the tacos and top with cilantro, sriracha, and sesame seeds. Thank you! :) I appreciate that! Thanks Pam! They really were pretty tasty and the "taco shells" were super fun!